Mark Billingham burst onto the scene in 2001 with one of the most exceptional crime fiction debuts in recent memory, SLEEPYHEAD, which introduced gritty yet layered Detective Inspector Tom Thorne, and his investigative adventures set amongst the seamy world of greater London. In BURIED, the sixth DI Thorne novel, Billingham eschews the grisly serial killers of his earlier work, and turns his storytelling talents instead to the tale of a missing teenage, Luke Mullen, who unknowingly finds himself at the centre of an elaborate spider-web of long-hidden secrets and present day fears. The son of a high-ranking former police officer, Luke is last seen getting into a car with a mysterious woman. Then a shocking videotape arrives. Still scarred from his time on the streets in LIFELESS, and struggling with the fiery death of his befuddled father, Thorne is plucked from his workplace funk and put on special assignment to the Kidnap Unit. His suspicions are soon aroused when Mullen Sr, a retired DCI with links to Thorne's in-house nemesis Trevor Jesmond, draws up a list of names of crooks that might hold a grudge. One very notable expected name, the main suspect in an unsolved murder, is missing. Thorne's desperate search for the boy is further complicated by an unpredictable kidnapper, tenuous links with a racially-motivated murder, and ongoing changes in Thorne's professional and personal life. 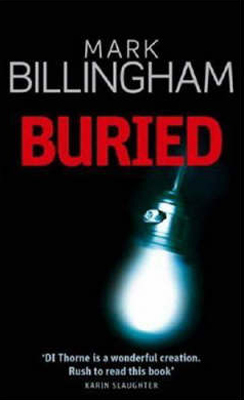 With BURIED, Billingham once again delivers crime fiction of paramount quality; tightly weaving an engrossing plot amongst an authentic world of layered characters in a well-evoked setting, with undercurrents of social commentary bubbling beneath. His dialogue, narration, and action are near faultless, leaving the reader whisked along on a page-turning ride, blessedly undisrupted by the clumsy author's hand so noticeable amongst less-talented storytellers. Thorne continues to evolve as a character, and Billingham's continuing excellence makes his creation arguably the best-written detective in British crime fiction today. Importantly, Billingham also imbues the supporting cast with degrees of depth uncommon amongst many of his crime writing contemporaries. The author's early work saw him favourably compared to some leading lights and all-time greats of the crime genre. With the quality of books such as BURIED, Billingham now deservedly shares a place firmly amongst them. Craig Sisterson is a New Zealand based writer and crime fiction reviewer.